When the Woodside Building was constructed in Greenville in the early 1920s, it was a symbol of the city’s prosperity and ambition. At 17 stories it was the tallest building in the Carolinas, and could be seen on the horizon from miles away. 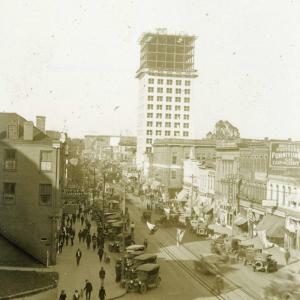 This collection of photographs documents the building’s construction from – literally – the ground up, and includes scenes not just of construction but of Greenville’s Main Street and bits of everyday life downtown. The scrapbook in which the photographs are found includes additional information about the Woodside, including newspaper clippings, and is held in the archive of the Greenville County Library System’s South Carolina Room.